Edna Patterson-Petty and U.S. 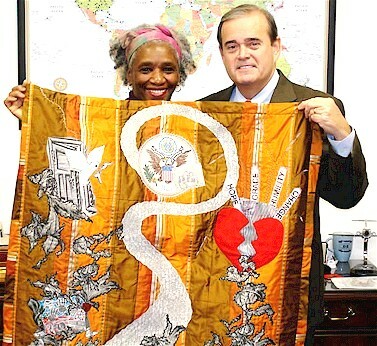 Congressman Jerry Costello of Belleville display Patterson-Petty's quilt "Road to Redemption" before it was sent to Washington DC. A phone call from Washington DC and the discovery of some old silk curtains have forever connected Edna Patterson-Petty of East St. Louis to the Inauguration of President Barack Obama. Patterson-Petty is a renowned quilt-maker and alumnus of SIUE who was chosen by the Historical Society of Washington, DC to make a display as part of "Quilts for Obama," an exhibit honoring the 44th President of the United States. A total of 60 quilts marking this occasion will be on display at the historical society through July 26, 2009. "I said 'yes' right away," Patterson-Petty recalled responding after receiving a phone call to create a quilt for the display. "The very next day I went in my studio and started laying out my design." The inaugural piece would be no challenge for this seasoned quilt-maker. Patterson-Petty said she was "good to go" as soon as she was sure of the size requirements. No new materials were purchased for her 36-inch by 36-inch quilt. "I prepared an old silk curtain by ripping out the hem," she said. Patterson-Petty said she was eager to make the quilt because of her passion for Obama's campaign. "Yes, I had always voted, but I was never vested in it like this," she said. "I was inspired by his inclusion of all people and excited that he was an African American 'positive' and 'inspirational' man." She said her quilts are culturally significant because of the emotions each one portrays. "I am telling a story based on my feelings, my concerns," she said. Patterson-Petty said the inaugural quilt, "Road to Redemption," is her greatest achievement yet because it tells not only her story, but the stories of many African-Americans of the past. "There are really no words to truly express how I feel," she said. "The significance is monumental. It is like winning the lottery in a really big way." 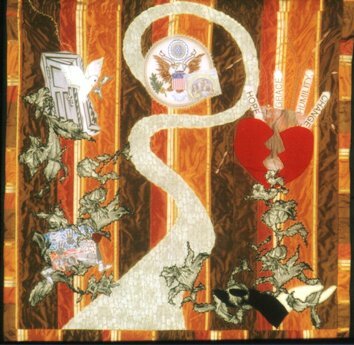 A closer view of "Road to Redemption"
The finished quilt depicts a winding road, a pair of biracial hands, foliage, a door, keys, a heart, the White House seal and an image of the Obama family. She said she chose these specific images to show the difficult road paved by Civil Rights leaders, which made Obama's election possible. Images of a bus, the word "vote," a child's hands, a pair of feet, a shackle and a stack of books also comprise the quilt. "They are all symbolic of the marching for Civil Rights, the bus boycott, children bombed in Birmingham, black voter registration, equal education and slavery," Patterson-Petty said. Currently, she is working on more than seven Obama-inspired quilts. Patterson-Petty went most of her life without realizing her passion for this particular art form. When she was a child, Patterson-Petty never found much excitement in helping her mother cut fabric and release hems to create bed quilts from old clothing. "I did not even start school until I was 34 years old with four children," she said. At the time, she didn't realize that her education at SIUE would provide the foundation for her life's cause. Her studies introduced her to many mediums for art, all of which she found fascinating. "It was truly heaven," Patterson-Petty said. However, she soon found herself drawn to the same type of work she witnessed her mother perform time and time again when she was a child. "I started making art quilts during my studies at SIUE," she said. "But instead of bed quilts, I began creating something that I would want to display in others ways--wall art. Tracy Colby was my favorite professor in the fibers program," she said. "She introduced me to a world of dyes and paints." Since she began creating art quilts, Patterson-Petty has been asked to speak at several community churches and programs in the Metro East area, she said. "I know that my art gives many people that know me personal ownership," she said. "Many people from the area are proud of me and value my opinion. I have put my heart and soul into it." Patterson-Petty received a bachelor of fine arts degree from SIUE in 1984, and later finished her masters degree in studio art and art therapy in 1988.